430 pages | 6 B/W Illus. Provides a more intense exploration of religion as a primary cause of contemporary terrorism. Focuses on the role of social media in recruitment and propaganda. Examines the radicalization and recruitment by ISIS to fighting and to domestic young people to carry out attacks at home. Explores the growing threat – and reality – of cyber attacks. Updates the material on the networking of terrorism today. Terrorism in the Twenty-First Century is the best book to understand the contemporary terrorist threat, its evolution, and the range of state responses to it. Cynthia Combs’ mastery of the subject makes this an easy-to-read book for students, instructors, and terrorism analysts. Terrorism in the Twenty-First Century is one of the best introductions to the study of terrorism on the market. Cynthia Combs provides an up-to-date, well-organized, and thought-provoking overview of the discipline, and her book is thus essential reading for anyone interested in the study of terrorism and political violence. The expanded discussion of religion as a potential cause of terrorism and the addition of a section on the role of social media in radicalization and recruitment further strengthen this new edition. 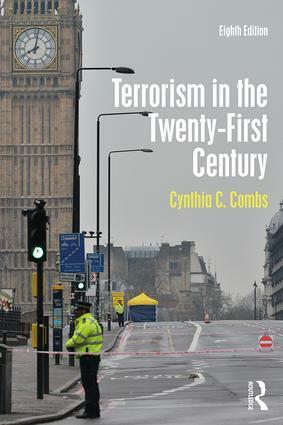 Cynthia Combs's Terrorism in the Twenty-First Century takes the hysteria out of the debate on this subject. Through a plethora of excellent case studies, she provides cogent analysis that demystifies modern terrorism, while capturing the horrors of this crime against innocents. In this new edition, discussion questions in every chapter challenge the student to reassess what they think about this phenomenon. Combs provides a comprehensive overview of terrorism, the best on the market to date, setting it in its historical, political, and philosophical contexts. The eighth edition of Terrorism in the Twenty-First Century offers a compelling, uniquely readable, and admirably up-to-date account of terrorism and counter-terrorism. Each chapter offers a balanced and thoughtful analysis, including specially valuable coverage of comparative counter-terrorism, international law, and ethical considerations. Cynthia Combs places the U.S. response to terrorism in comparative context by considering other developed democracies’ responses. Reminding the reader that terrorism is hardly new, she also points to social and technological changes that make understanding terrorism today especially urgent. With Terrorism in the Twenty-First Century, Cynthia Combs has written a highly readable and accessible introductory text to the study of terrorism. This new edition expands on issues such as radicalization, social media, cyber terrorism, and lone wolves. Combs’ excellent synthesis of the research literature and deft use of case studies to illustrate points are broad enough for beginners to political science and international relations and, simultaneously, deep enough for advanced students. I am excited to assign the eighth edition of Terrorism in the Twenty-First Century to my students. Once again, Cynthia Combs’ timely revisions reflect the evolving issues and current trends in terrorism and its study. This methodically written work is the one terrorism text that always maintains my student’s interest. Having used this excellent text for nearly six years, I can state that this new edition is a satisfying update. With strong analysis, case studies, and discussions, Cynthia Combs empowers students to take the conceptual frameworks provided in the chapters and apply them to fast-changing events in the field. Her chosen focus on the legalities of terrorist acts, which are less biased than subjective assessments of terrorists and their groups, is valued by instructors. The book’s focus on technology and how that applies to the potential infringement – not only on personal safety but government operations, finances, and infrastructure – is always popular with students. Cynthia C. Combs is Bonnie E. Cone Distinguished Professor of Political Science at the University of North Carolina-Charlotte. For Instructors Only: An updated Test Bank with multiple choice, true/false, and essay questions all keyed by page number to the text. Link to the State Department’s interactive Geographic Information System (GIS) Web Map of locations for terror groups around the world. Link to the State Department website focused on terrorism, which has information on groups, chronologies, etc.